This fresh orientation to Kant's Critique of Pure Reason presents his central theme, the development of his Transcendental Idealism, as a ground-breaking response to perceived weaknesses in his predecessors' accounts of experiential knowledge. Traces the central theme of the Critique, the development of Kant's Transcendental Idealism. Offers new and original readings of the central arguments in both the Transcendental Aesthetic and the Transcendental Analytic. Appraises the success and failure of Kant's project in the Critique. Anthony Savile is Professor of Philosophy at King's College, University of London and also teaches at Charles University, Prague. His previous books include The Test of Time (1982) and Leibniz's Monadology (2000). Experience and Judgment: The Metaphysical Deduction. Understanding, Objectivity and Self-Consciousness: The Transcendental Deduction. The Principles of Pure Understanding. Cognitive Rewards: The Refutation of Idealism, the Self and Others. A Caveat by way of Afterword. 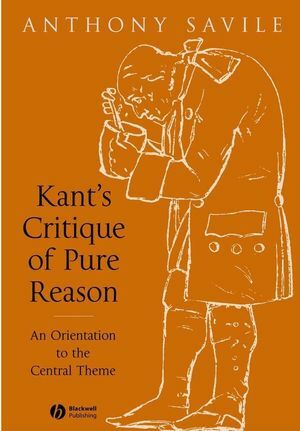 A critical orientation to Kant's Critique of Pure Reason. Presents Kant's views in the Critique as a response to perceived weakness in his predecessors' theories.